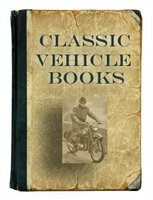 This selection of general classic Japanese bike books cover the history and development of the Japanese motorcycle industry, Japanese makes and models. Japan's Motorcycle Wars: An Industry History by Jeffrey Alexander (2008) examines the historical development and societal impact of Japan's motorcycle industry throughout most of the twentieth century. Japanese Motorcycles: The Machines And The Men Behind Them by Cyril Ayton (1981) examines Honda, Suzuki, Yamaha and Kawasaki - the Big Four motorcycle manufacturers. The Great Japanese Motorcycles - Honda, Kawasaki, Suzuki, Yamaha by Cyril Ayton (1981). Afficionados of vintage Japanese motorcycles and motorcycle history in general will find things to savour in this nicely illustrated book that focuses on noteworthy models and history from Honda, Kawasaki, Suzuki and Yamaha. The Hamlyn Guide To Japanese Motor Cycles by Cyril Ayton (1982) contains entries on a broad range of the bikes produced by the 'Big Four' Japanese makers - Honda, Suzuki, Yamaha and Kawasaki - from humble 50cc runabouts to the exotic Honda CX500 Turbo. A panel of technical specifications accompanies most entries, and the descriptions contain not only facts but also assessments of the bikes. 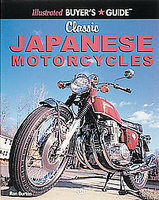 Classic Japanese Motorcycles (Illustrated Buyer's Guide)by Ron Burton (2000). This buyers guide divides the world of classic Japanese motorcycles by the four major manufacturers Honda, Kawasaki, Yamaha, and Suzuki. Photos are accompanied by complete descriptions of specs, components, paint codes, and serial numbers. A rating system grades the bikes while the author highlights common repair and restoration needs and suggests sources for collectible models. 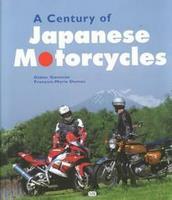 A Century Of Japanese Motorcycles by Didier Ganneau (2001) spans a full century of Japanese motorcycles, featuring the landmark models from Honda, Suzuki and Kawasaki that invaded American shores in the 1960s (and are today among the most sought-after collector bikes), as well as long-forgotten motorcycles from names like Hodaka, Bridgestone, Miyata and others. Complete specifications and production histories are provided for each model, along with photography that includes evocative period imagery and modern colour shots depicting pristine motorcycles from private and company collections. Classic Japanese Motorcycle Guide by Rod Ker (2007) is the definitive guide to identifying, buying and riding Japanese bikes from the 1960s to the early 1990s, concentrating on mainstream, affordable models from the 'big four': Honda, Kawasaki, Suzuki and Yamaha. The book provides a brief history of the Japanese motorcycle industry, its post-war rise and displacement of traditional British, European and American marques. Specific bikes are then grouped and discussed in detail, providing an essential reference for buyers and enthusiasts alike. 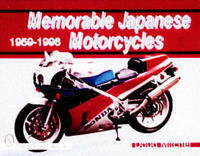 Memorable Japanese Motorcycles 1959-1996 by Doug Mitchel (1997). This beautifully photographed volume surveys the Japanese motorcycles which have helped steer the American cycling habit since the late 1950s. Examples of first models, last models, and the most unusual Japanese machines to hit American shores are covered in detail. Almost every motorcycle shown is 100 percent original or has been painstakingly returned to its original form. The first machines from Japan were simple, lightweight units that could be ridden by anyone, and opened up new roads for the neophyte rider. As the years progressed, the offerings from the Japanese makers became the ones to beat. Chilton's Japanese Motorcycle Repair And Tune-Up Guide by Ocee Ritch (1968) is a comprehensive guide for the maintenance, tune-up and repair of Japanese motorcycles. Each chapter is clearly written and contains step-by-step procedures, complete specifications, many illustrations and helpful hints on taking care of your machine. Included are Bridgestone, Bonanza, Minibike, Hodaka, Kawasaki, Marusho, Omega, Tohatsu and Surfrider. 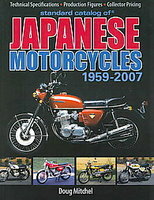 Pictorial History Of Japanese Motorcycles by Cornelius Vanderheuvel (1997) covers the Japanese motorcycle from just after World War Two. The important models in each period are described. 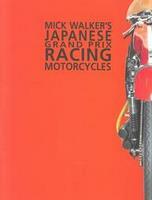 Classic Japanese Racing Motorcycles by Mick Walker (1991). After World War II, the Japanese motorcycle industry sought to improve competitiveness in the export field against entrenched European marques and racing was seen as the obvious way to improve credibility and gain publicity. Walker looks at the men, the machines and the events. Japanese Classics (Autumn 1983). A Motor Cycle News Special - This 'Motor Cycle News ' special magazine looks at twenty of the most interesting 1960-1972 Japanese road models.